Kitt's World: Are you feeling lucky, Irish that is?? Are you feeling lucky, Irish that is?? Are you feeling lucky? Irish that is. 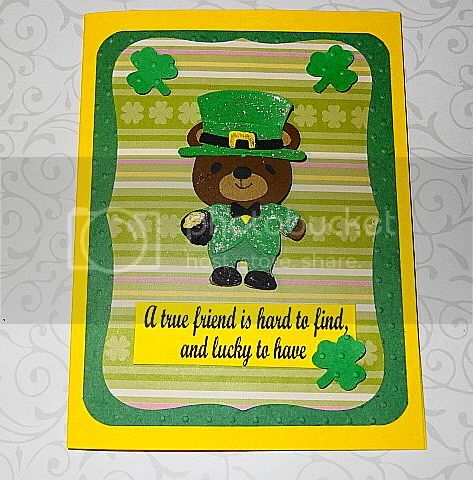 This cute little bear from the Bears on Parade cartridge shows we can all use a bit of luck. And how lucky we are when we have more friends than our house can hold. (an old Irish saying). The bear was cut at 2". I used the new year hat instead of the one they have for the Irish bear outfit. I used a stargel glitter pen to add sparkle to his hat, jacket & the pot of gold. The shamrocks were cut at 1" from the Create a Critter 2 cartridge. I used the swiss dots cuddlebug folder for the shamrocks and the green layer background paper. 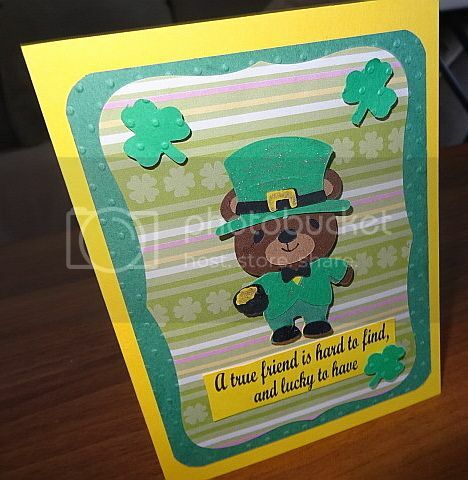 I cut the shamrock stripe paper (from Reflections All Seasons paper pack) with a Spellbinders label die. The bear and the shamrocks are on pop dots. The sentiment was printed on the computer. This card was entered into the Cardz TV Challenge. Comments are appreciated. Thanks for stopping by. Very cute. Love the sentiment. Thanks for playing along at Cardz TV. Super cute bear, thanks for joining CTVS! Roo Hops to another challenge!